Our holy Father Raphael was born in Syria in 1860 to pious Orthodox parents, Michael Hawaweeny and his second wife Mariam, the daughter of a priest of Damascus. The exact date of Raphael’s birth is not known, but he estimated it to be on or near his Name Day, the Synaxis of the Holy Archangels Michael and Gabriel and all the Bodiless Powers of Heaven (November 8). Due to the violent persecution of Christians, at which time their parish priest, St Joseph of Damascus (July 10) and his companions were martyred, the Hawaweeny family was forced to flee to Beirut for their safety. It was here that the future saint first saw the light of day, and not in the city of his parents. Indeed, as the child’s life unfolded, it was evident that he would have no continuing city in this world, but would seek the city which is to come (Heb 13:14). This was the normal state of affairs in America at the time. Archimandrite Raphael welcomed Bishop Tikhon when the latter replaced Bishop NICHOLAS as the ruling bishop in America. On December 15, Saint Tikhon came to serve the Liturgy at the Syrian church of St Nicholas. Raphael told his people that their new Archpastor was one who “has been sent here to tend the flock of Christ — Russians, Slavs, Syro-Arabs, and Greeks — which is scattered across the entire North American continent.” At that time, of course, there were no parallel jurisdictions based on nationality. The Church united those of diverse backgrounds under the omophorion of the Russian Archbishop. This was the norm until the Russian Revolution disrupted church life in Russia, and also in America. In December of 1901 Archimandrite Raphael was elected as Bishop of Zahleh. Patriarch Meletios sent a telegram congratulating him and asking him to return. Father Raphael thanked the Patriarch, but again declined higher office. He said that he wished to complete the project of building a temple for the Syrian community in New York. The following year, he bought an existing church building on Pacific St in Brooklyn, and had it remodeled for Orthodox worship. Bishop Tikhon consecrated the church to the great joy of the faithful in attendance. Thus, Saint Raphael’s second major project was finished. In 1903, the Holy Synod of Russia unanimously elected Archimandrite Raphael to be the Bishop of Brooklyn while retaining him as head of the Syro-Arab Orthodox Mission in North America. The Holy Synod announced the election to Patriarch Meletios, who was pleased by their decision. Bishop Tikhon wrote to Saint Raphael to inform him of his election, and Father Raphael sent him a letter of acceptance. Meanwhile, Fr Innocent Pustynsky was consecrated as Tikhon’s first auxiliary bishop at St Petersburg’s cathedral of Our Lady of Kazan. 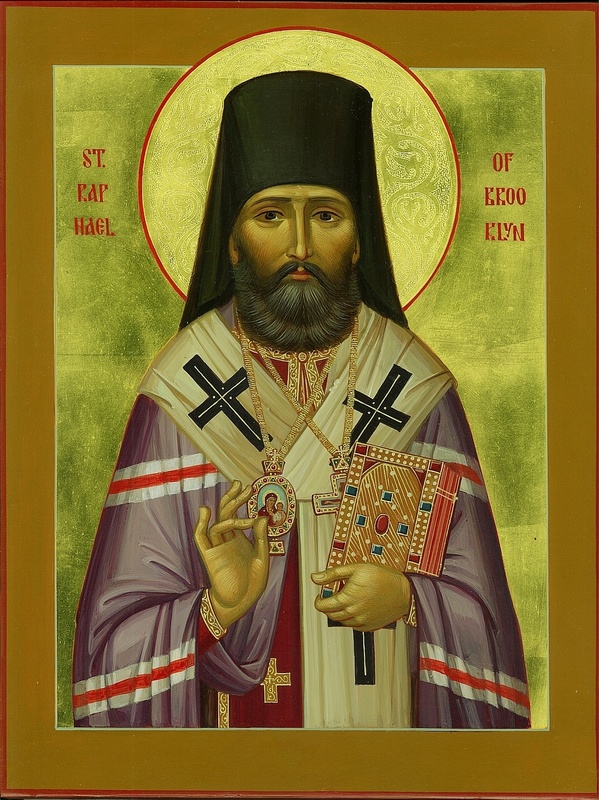 On the third Sunday of Lent in 1904, Saint Raphael became the first Orthodox bishop to be consecrated on American soil. Bishop Tikhon and Bishop Innocent performed the service at St Nicholas Cathedral in Brooklyn. The new bishop’s vestments were a gift from Tsar Nicholas II. Following his consecration, Bishop Raphael continued his pastoral labors, ordaining priests and assigning them to parishes, and helping Bishop Tikhon in the administration of the diocese. In July of 1905 Bishop Raphael consecrated the grounds for St Tikhon’s Monastery and blessed the orphanage at South Canaan, PA. Three days later, he presided at a conference of diocesan clergy at Old Forge, PA, because Archbishop Tikhon was in San Francisco. Among the clergy in attendance were three who would also be numbered among the saints: Fr ALEXIS Toth, Fr Alexander Hotovitzky, and Fr John Kochurov (the last two would die as martyrs in Russia). Taking heed of St Paul’s words to pray in a language that people understood (1 Cor.14:15-19), St Raphael recommended the use of the Service Book of the Holy Orthodox Catholic Apostolic Church (translated by Isabel Hapgood) in all of his parishes. 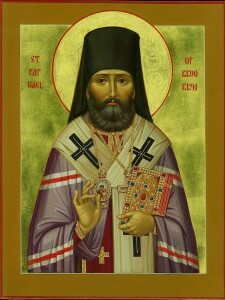 In March of 1907 Saint Tikhon returned to Russia and was replaced by Archbishop PLATON. Once again St Raphael was considered for episcopal office in Syria, being nominated to succeed Patriarch GREGORY as Metropolitan of Tripoli in 1908. The Holy Synod of Antioch removed Bishop Raphael’s name from the list of candidates, citing various canons which forbid a bishop being transferred from one city to another. On the Sunday of Orthodoxy in 1911, Bishop Raphael was honored for his fifteen years of pastoral ministry in America. Archbishop PLATON presented him with a silver-covered icon of Christ and praised him for his work. In his humility, Bishop Raphael could not understand why he should be honored merely for doing his duty (Luke 17:10). He considered himself an “unworthy servant,” yet he did perfectly the work that fell to him (St Ignatius of Antioch, Letter to the Ephesians).